Three years ago Yellow Tree Theatre faced a dilemma: the rights to the Christmas show they were planning to do were pulled, and they only had a few weeks to come up with something. They performed a “miracle.” They wrote and produced an original play in a few weeks that turned into a hit that ran every December for three years. Miracle on Christmas Lake is about a small town Minnesota theater that has to develop a play in a few weeks in order to keep the theater from closing down, and they do it to hilarious effect. This year Yellow Tree is presenting the brand new sequel, Miracle on Christmas Lake II (both shows written by Jessica Lind). Our favorite characters return (except for the soap fan with the hairy mole) – Colin, who runs the theater, and his wife Tess are now parents of a six month old baby, and Martha, loveable despite (or because of) the fact that she embodies every bad stereotype of Minnesotans, is now (sort of) engaged to her nerdy Little House on the Prairie loving costar from last year’s production. The town of Christmas Lake is in danger of being annexed, and the town savior appears in the form of Hollywood scout Joey Deschantel, who is going to recommend the town to his producers as location for the upcoming remake of It’s a Wonderful Life, starring famous Minnesota actors Josh Hartnet and Jessica Biel. He takes charge of the town Christmas pageant, making it into a spectacle so Hollywood will take notice. That’s a whole lot of complicated exposition, but the details of the story don’t really matter. What matters is that this is a hilarious show with tons of heart and local flavor. It’s not the usual holiday sugary sweet schmaltz, but you’ll still leave the theater with a warm glow to carry out into the cold Minnesota night. You’ll remember fondly this crazy quirky little Minnesota town full of loveable characters that may actually resemble people you know. Of the four returning characters from the original Miracle on Christmas Lake, only one is played by the same actor: Ryan Nelson as the nerdy Neil. My favorite thing about Neil is his love for Little House on the Prairie, which I share. It was my favorite show as a kid and I still have to stop and watch whenever I come across it on TV. (Beth and Manly!!) The other fun thing about Neil is that he thinks it’s not acting if you use your normal speaking voice, so he always imitates a famous actor, despite the director’s protests. 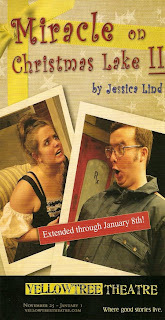 Said director is played by Andy Frye who played Hunter in [title of show] this spring. His super high energy brings new life into the little town. The moon boot and high-waisted jeans wearing Martha Knutson is played this year by Carolyn Trapskin, and she ably contorts her face and voice into the weirdness needed for this character. And it works for her, she has three men chasing after her! Our sane couple (loosely based on Yellow Tree founders, director Jason Peterson and playwright Jessica Lind) are played this year by J.C. Lippold and Mary Fox (both of whom also appeared in [title of show]). Mary's given some great and diverse performances around the cities this year, as she does again here. While she effortlessly created an outrageously quirky character in Theater Latte Da’s Spelling Bee this fall, she does a great job here of playing the straight role among these other crazies (although she does get to appear in a tutu and speak in rhyme). J.C.’s Colin is a calming, grounding presence as the man who desperately wants to save his hometown, because he doesn’t know who he is without it. Gary DuBreuil fills out the cast playing several diverse roles, from a minister to a volunteer police officer to a Hollywood producer. All together it's a very capable and entertaining cast that plays well together on the little stage (which is an actual raised stage for this production). I think it's safe to say that their Christmas show is Yellow Tree’s most popular show of the year; it's playing six days a week (which their other shows typically do not) and has been extended into January. If you're looking for a fun and non-traditional holiday show that still has that traditional holiday spirit, check it out, especially if you’re in the Northwest suburbs. And make sure to get there in plenty of time to get seats. I went with a group on a Tuesday night and it was packed, maybe even sold out. We were enjoying our half price bottles of wine at nearby Nectar Wine Bar (which I highly recommend for a pre-show dinner) so much we didn’t get to the theater as early as we hoped, so we had to take whatever seats we could get! But even from way in the corner it was a thoroughly enjoyable evening. Hey, you forgot Katherine - she was back from the original! It is a very fun evening with plenty of laughs.